APP was great and may have stolen the show. I have seen Yes many times before. Somewhat of a disappointing set and nothing from their latest release, Open Your Eyes. 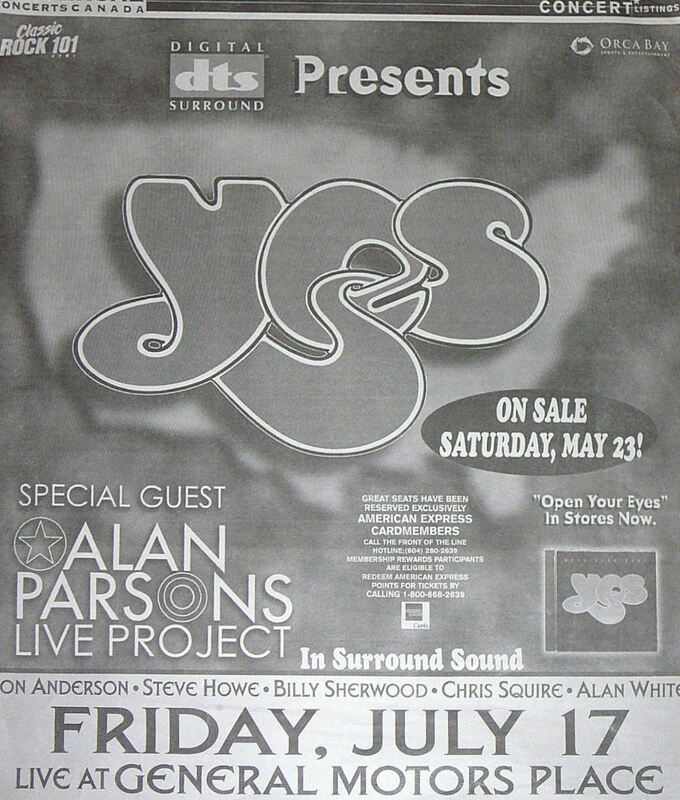 I went to this show expecting to see a bunch of old has-beens rehashing a bunch of old tracks. It was the BEST show of my life!!! Chris Sqire IS the band. He commanded GM Place with the majesty of a warloard (he did look quite silly in the black spandex). All the songs were in top form and it was an experience of a lifetime! 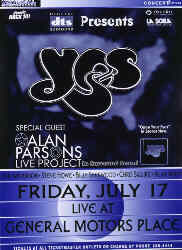 Well, the 17 July 1998 APP/Yes concert at G.M. Place in Vancouver, B.C. is now history. I'm not prepared to write too much about it right now, but I'll summarize a bit. The first thing: TicketMaster are complete assholes. Just a bunch of bitchy little robots who think that "customer service" means screwing people out of $100.00 -- but that story will be for another time. It's funny that when I came through the doors, security didn't bother to search me. It's really easy to sneak a single-use disposable camera into the arena when they aren't even searching people! ;-> Some photos from this night should be on my web space within the next couple weeks. Ultimately, we wound up seated near the left end of row 13 on the floor. 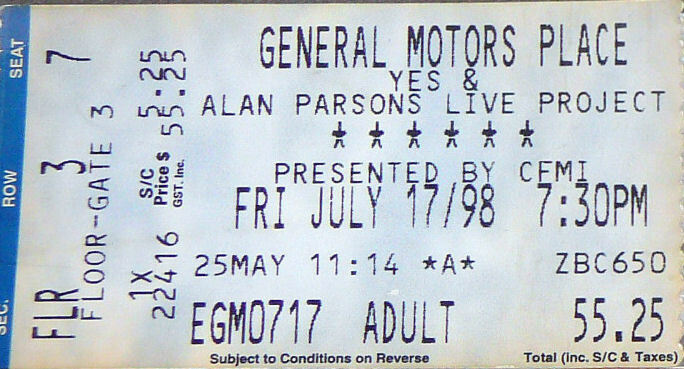 The Alan Parsons Project was great. I only recognized about half of the songs. The singer seemed a little strange to me 'cos he was dressed in this almost Henry Rollins-like way, with a black tank top "muscle shirt" and a bandana on his head, and leather "Jim Morrison" pants. That didn't seem appropriate for APP, to me, but whatever... He sang great, so I suppose that's a superficial complaint. Parsons himself was very cool. His role in that band seems to be much like what I like doing with music. Altghough he wrote all the music, he was content to just stand at the back of center stage gently strumming an acoustic guitar, sometimes playing a keyboard part, and adding a few backing vocals for only 3-4 songs. For such a great artist, he seems to have his ego well in control. It's interesting to me that, although it's called "The Alan Parsons Project", it seems like all the members are equals, including Parsons himself. I can really admire that. I can't say the APP setlist (or the Yes one for that matter). But I know that among the songs the player were "Psychobabble" and a pumped-up version of "Standing on Higher Ground" (the latter of which has been stuck in my head much of the night). IMO, the best part of it was when the played about 2-3 minutes of "I, Robot" (my favorite APP song by far) and then did a *BEAUTIFUL* smooth segue into "Eye in the Sky." The encore was the song (whose name I forget) that starts with "Where do we go from here, now that all of the children are growing up." (Actually, I never much liked that song, and didn't know it was them.) Anyways APP were great! There was about 30 minutes between APP and Yes, during which the lights came up and roadies inconspicuously managed to change the equipment on stage. At about 8:40 or 8:45,the PA system started playing a sound collage much like Pink Foyd's 1994 pre-show soundscape. A very nice treat, and it seemed strange to me that the crowd payed so little attention to it. The soundscape consisted of a tape loop of crickets and pastoral noises (similar to, if not identical to, the sounds at the very beginning of "Close to the Edge") but with Anderson & Co singing unique sentences every few minutes. Does anybody have the complete text of what they sing during the soundscape? I'd love to see it. Igor's solo was longer than the one on the webcast from Chicago. Dont Miss this show if your looking for very fine musicianship.